From ornate cannonball safes and rectangular double walled cast iron creations to massive pressure sensitive vaults with ornate bankers' doors, antique bank safes are highly valued for their beauty, craftsmanship and historical significance as precious treasures of the past. Although most early bankers kept their money secured in their bank's safe, there are many stories of bankers that took their money home and kept it under their beds while they slept. Others are said to have locked up the bank's safe each night and then deposited the money into a trash basket covered with papers or a cloth for safekeeping until morning. There is even one old western myth that tells of an Oklahoma frontier banker that kept his bank's money in a grated box complete with rattlesnakes inside. Whether these stories are true or not one thing is certain, early bankers knew how important it was to show the depositors that the money kept in their banks was safe. Bankers displayed their ornate cannonball safes as a way of reassuring their customers that the money they deposited was safely kept. Other banks often kept their vault doors open to allow their customers full view of the safe and its sturdiness. The cannonball safes were constructed of two sections, a bottom section that had legs holding a large metal box and a huge round metal ball attached to the box. Important documents were kept in the bottom section of the safe while paper currency, gold and silver were kept in the round top section. Weighing approximately 3,600 pounds cannonball bank safes were considered robbery proof because of their massive weight and round shape. To view a beautiful example of this type of antique safe, made by the Diebold Safe and Lock Company, visit Goodman, Wesson, and Associates Antique Firearm Appraisal and Gun Appraisal. Shown in detail is a 1870s cannonball safe from the Van Dyne State Bank of Chicago. Just as the cannonball safes, most rectangular antique safes used in banks were lavishly decorated with hand painted details including many beautiful scenes or floral paintings. These safes had a single door or a set of double doors. Walk-in safes and vaults were generally placed in many larger bank buildings in cities. In m many instances, the building was built around the massive walk in safe or bank vault. The following websites offer pictures of several of these special antiques. The Downtown Center shows an antique Diebold bank vault door that weighs approximately 4500 pounds. Among the safes shown at Protection Lock is a beautiful round door Mosler bank vault door. A most unusual strongbox safe offered by Carlton Hobbs LLC of New York City, is believed to be made by the Tula workshops of Russia in approximately 1815. This unusual antique steel safe fires two loaded pistols aimed at anyone that opens it incorrectly. In addition, there is a complex locking mechanism that consists of several inside safes, multiple bolts and hidden keyholes. The details of the history of this safe are unknown. Although no trace of an imperial monogram has been found, it is believed that this unique safe may have been made for imperial purposes. Perhaps it was even used in one of the Russian state banks that were established in the late 1860s. Maybe someday the history of the shooting safe will be discovered. 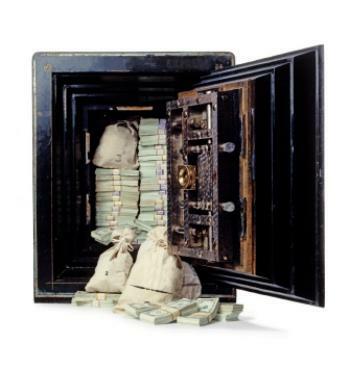 Antique bank safes are occasionally found at auctions or antique stores completely restored. However, there are also many that are in need of professional restoration.